Korniakt building (Будинок Корнякта, aka Палац Корнякта). (Photo: Korniakt building.) One of the finest monuments of Renaissance architecture in Ukraine. It was built for Konstiantyn Korniakt in 1580 at no. 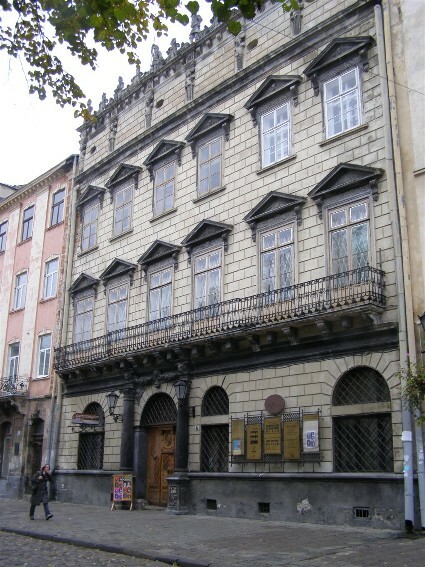 6 Rynok Square in Lviv by the architect Pietro di Barbone. In 1623 the building was acquired by the Carmelite monastic order, and in 1640 by voivode J. Sobieski. The Eternal Peace of 1686 was ratified there by Poland and Muscovy. In 1908 the building was bought by the city and after extensive renovation became the King Jan III Sobieski Museum. 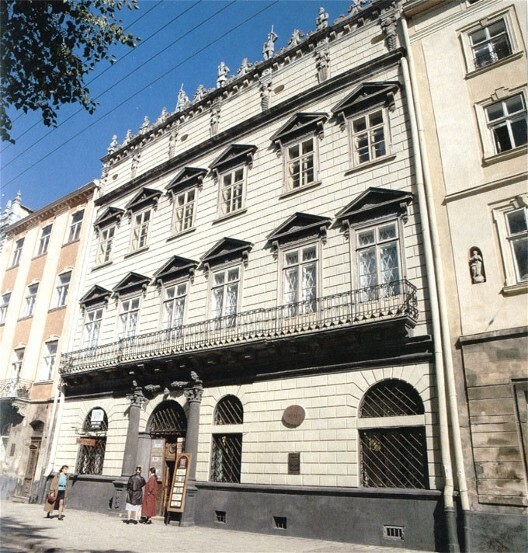 Since 1940 it has housed the Lviv Historical Museum. The structure consists of three stories and an attic. The lowest stage of the facade has three windows and an impressive portal framed by two Corinthian columns, surmounted by mascarons, and topped by a lion's mask flanked by two garlands. This entrance was added in 1678 and is the work of local sculptors. The second and third stories have six windows each. The attic, added to the building in 1678, is adorned with seven caryatids and atlantes supporting an architrave and Ionic frieze with consoles, and is topped with statues of a king and six fully armed knights, which are tied together by volutes of stylized dolphins. The rear facade, facing Fedorov Street, has an inscription of the construction date and a simpler portal consisting of two pairs of columns and a cornice with a cartouche, volutes, and the family coat of arms. The first floor of the interior consists of a vestibule with a Renaissance ceiling, two large Renaissance halls on the right, and a Gothic hall, dating back to the 16th century, on the left. 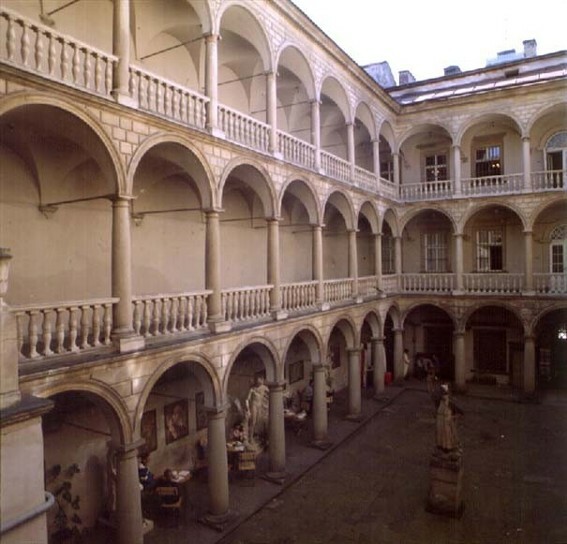 The staircase on the left was built in the late classical style of the 18th century and the iron balustrade was made by Lviv craftsmen. The halls on the second story are more elaborate and were designed in the 18th century. The Italian Renaissance courtyard is enclosed in a graceful three-tier loggia with Tuscan columns. The Korniakt building is often compared to Palazzo Avignonensi in Montepulciano, Italy.